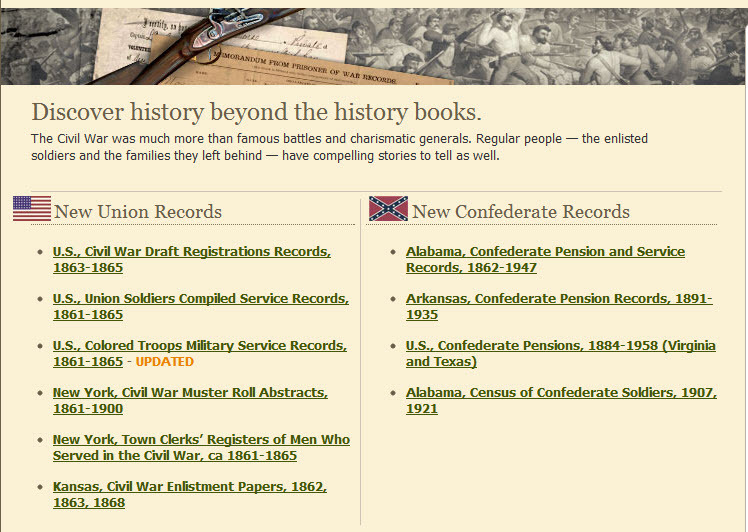 Follow Friday: Ancestry Civil War Collections–Worth Another Look! Much of my family’s history was shaped around the American Civil War, so I have been eagerly anticipating the crisis’ Sesquicentennial. Photographs and documents, long held in private collections, are being sought for public collections, like that of the Civil War 150 Legacy Project at the Library of Virginia. Public documents, long preserved and accessed on site, are being digitized and shared on-line. Case in point, Ancestry just announced the assession of several new collections like the US Draft Registration Records and the US Confederate Pensions Collection, 1888-1958. I discovered that my great-great-grandfather Ira Sayles had blue eyes and dark hair from his 1862 registration in the 130th Regiment NY Volunteers. And I confirmed that great-great-grandfather Francis Marion Minor of Greene County, Pennsylvania was drafted in 1863–but sent a substitute. In the Confederate (Widows) Pensions File of 1888, I discovered that great-great-granduncle Benjamin Franklin Dodson of the 34th Virginia Infantry (Mecklenburg County) was shot through the brain by a Union minnie ball on 6 July 1864 in the lines outside of Petersburg. I am fascinated by the number of features in this Ancestry collection that prompt the user to explore beyond ancestral information. 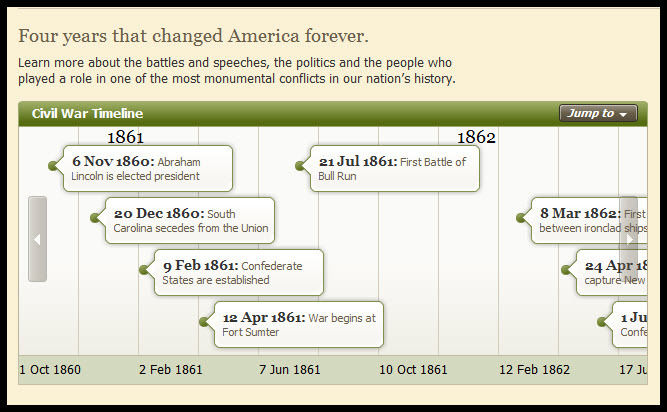 For instance, this timeline at the bottom of the page begs the reader to review events and examine how ancestor records fit in–pictures, timelines, graphs are often so helpful in this regard. The events of the Civil War affected my ancestors’ life choices: a carpetbagging Clifton Sayles was prohibited from marrying young Lillie Dodson until after parents died and they were middle-aged. The Minor and Dodson family farms were ferociously tended, defended and passed on as coveted assets–safe havens for subsequent generations faced with their own economic crises. In taking the time to study the Civil War, I have deepened my understanding of my country and my family, past and present. I harbor this hope that I am building a shared memory with other family historians/genealogists, and that this common understanding of our country’s past might inform a more powerful, insightful understanding of our country’s present. Maybe, just maybe, this genea-community can be a force for creative, civil discourse as our country navigates the current economic, political and social crises. Congratulations on your progress through your formal studies and sharing how you have integrated those into your understanding of personal history, Kay!